Win an Asiana Business Class Amenity Kit! Our recent unBOXing of an Asiana Business Class Amenity Kit means it’s now just sitting in the Modhop Travel Cave with nowhere to go. That is, until someone wins it. Enter now and you’re in the running for this bag filled with flight-time goodies from a faux leather sheath-protected comb to a small handful of L’Occitane products. The design meetings must have been very short. Very basic case for this Asiana Kit. The case: Basic, Bland, Boooring. If there’s a designer behind this bag, they don’t get a bonus this year. While the case has a few functional inner-pockets, there’s really no reason you’d want to re-use it. 3M-asterpiece: 3M’s earplugs are usually better than flimsier bulk-discount plugs some airlines try to get away with. 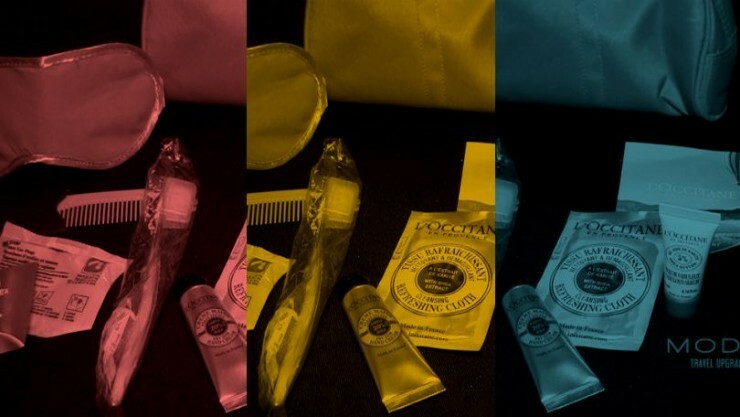 How do YOU say “L’Occitane”: The L’Occitane amenities are the best part of the kit. All items seem to do as promised from “moisturize” to “refresh”. Here’s the recent unBOX video. This is the same kit that we’re giving away so as you’ll see that it’s gently pre-handled. Enter by Wednesday, February 11, 2015.